Finish any race in 1st, 2nd, or 3rd Place. Just finish any race in 1st, 2nd or 3rd. If you can’t get this trophy after 4 races, then you will have a hard time getting this platinum. Finish Zany Zoo Cup in 1st, 2nd, or 3rd Place. Finish that particular championship cup in 1st, 2nd or 3rd. But if you are after platinum, you MUST come 1st. Finish Wild & Wacky Cup in 1st, 2nd, or 3rd Place. Finish Fabulous Freak Cup in 1st, 2nd, or 3rd Place. Come in first in all 50CC championships. Come in first in all 100CC championships. Come in first in all 150CC championships. Come in first in all 200CC championships. You have to finish first place all championships in each class. A quick reminder that you don’t have to come 1st place in EVERY race you do. But I repeat, you have to come 1st (have the most number of points) at the end of each championship you do. Perform a 3 stunt combo on Plane Wreck. One of the hardest trophies in the game. You have to perform 3 stunts in Plane Wreck track. This is not that hard but it’s annoying that if you don’t perform your stunts in time, you’ll crash and you have to go through the whole lap again. You can only do stunts at the end of the track. MAKE SURE YOU MIX UP YOUR STUNTS. Complete a race in Shark Beach without falling in the water. Just don’t fall in to the water during the “Shark Beach” race and the trophy is yours. Perform a 2 back flip combo on Foosa Rocks. Be careful when aiming for this trophy because you may forget the trophy description during the race. You must perform a TWO backflip combo in Foosa Rocks to earn this trophy. You’ll encounter a whole bunch on ramps during the race. Go on a ramp and perform a two backflip combo. Grab an Item Crate from above the water in NYC Zoo. I got this with my eyes closed. Didn’t even know there was a trophy for this. At one point, you drive in to the air above the river to perform your stunt and there are item crates on the air. Grab one and the trophy is yours. Perform a 4 stunt combo on Freighter. From the start of the race, make sure you take the first right and you’ll be driving up the long crate. As you come down, perform an easy 4 stunt combo. Complete a race on Volcano without falling in the lava. I got this when I was doing a time trial. Obviously for me, it was very hard to do during the championships because another opponent can knock you in to the lava or someone uses an item and you can’t control yourself and fall in to the lava. But yes, do the best you can and don’t fall in to the lava. Complete Shrek Swamp without getting hit by swinging logs. This is pretty easy but annoying. When driving through, you never know when the log is going to hit you. So stay in the middle and look out. Complete a race in Monsters vs. Aliens™ Mothership without getting zapped by the clones. Just don’t get hit by the lasers that zaps across some areas in the track and this trophy is yours. Complete a race in Watering Hole crossing the Hippo pond and avoiding the Giraffes. I was wondering why it didn’t unlock for me after playing the track 3 times. It’s because I didn’t cross the Hippo pond. It’s very easy to miss the Hippo pond. If you can, follow a computer controled kart and it will show you a shortcut which is crossing the pond. Oh and don’t hit a giraffe near the end of the lap. Win a Quick race or a Championship race with Alex. Win any race at least once with each of these characters and you should have all the license trophies in no time. Do a 50CC race and you’re all good. Win a Quick race or a Championship race with Marty. Win a Quick race or a Championship race with Melman. Win a Quick race or a Championship race with Gloria. Win a Quick race or a Championship race with the penguins. Win a Quick race or a Championship race with Chimps. Win a Quick race or a Championship race with B.O.B. Win a Quick race or a Championship race with Shrek. Win a Quick race or a Championship race with Julian. Beat the 50CC Time Trial Gold Medal time in Plane Wreck. All you have to do, is use the kart you are most comfortable with, and take all the shortcuts in every race. Make sure you drift to get Turbo so you are zoom through the race. If you make one mistake like falling off the road, restart the trial again. Beat the 50CC Time Trial Gold Medal time in Foosa Rocks. See “Plane Wreck Gold Medalist”. Beat the 100CC Time Trial Gold Medal time in NYC Zoo. Beat the 100CC Time Trial Gold Medal time in Freighter. Beat the 150CC Time Trial Gold Medal time in Shark Beach. Beat the 200CC Time Trial Gold Medal time in Volcano. Beat the 150CC Time Trial Gold Medal time in Monsters vs. Aliens™ Mothership. Beat the 200CC Time Trial Gold Medal time in Shrek Swamp. Beat the 150CC Time Trial Gold Medal time in Watering Hole. Win a 50CC single player Move It! Move It! race. See “Move It! Move It! 200CC Jammer”. Win a 100CC single player Move It! Move It! race. Win a 150CC single player Move It! Move It! race. Win a 200CC single player Move It! Move It! race. Basically 4 players (including yourself) and you must take the disco ball off a computer-controled player, have the disco ball to yourself and earn points. Be the first to get 50 points and the game will end. Collect 10 Hourglasses in one Single Player Checkpoint Race. Collect 25 Hourglasses in one Single Player Checkpoint Race. Collect 40 Hourglasses in one Single Player Checkpoint Race. All you have to do is collect 40 hourglasses in one checkpoint race. It can be any stage and these trophies stack. The NYC Zoo track seems to be the easiest track. If you collect all 40 hourglasses without fail, then 3 trophies are yours just like that. If you failed, don’t worry. Try again until you get 40 hourglasses. Collect 10 Hourglasses in one Multiplayer Checkpoint Race. Collect 25 Hourglasses in one Multiplayer Checkpoint Race. Collect 40 Hourglasses in one Multiplayer Checkpoint Race. Basically the same requirements for the “Checkpoint Master” trophy, but now it is multiplayer. You must have a decent second player to play with you. You need to collect 40 hourglasses EACH for the master trophy. Complete a lap without bumping into a wall. Got this when I did my first ever race in this game. Just don’t bump into anything (bumping into other karts is okay) and the trophy should pop up immediately after completing the lap. Do a 3 stunt combo in any race. The easiest stunt trophy. You can get this in your sleep on Mothership and Freighter. You can get it easily on other tracks to including NYC Zoo. Just go on a decent ramp, while you’re on the air perform a 3 stunt combo. Trophy should pop up once done. Make sure you don’t crash though on your landing. Do a 5 stunt combo in any race. When they mean any race, they mean Mothership or Freighter as those two tracks are the only tracks you can gain this trophy. This is the hardest trophy in the game as you’ll be trying over and over and over again until you get it right. While your kart is in the air, you have to perform 5 stunts before landing and not crash. There are two tracks you can get this trophy in. Freighter – When you go up that huge pipe. Also, the pipe is also the only way to get the “Danger Freighter” trophy. Monsters vs. Aliens Mothership – When you get sucked up in some blue vertex. You have to be very quick with your stunts otherwise you won’t make it. And I’ll say this again. Be sure to MIX up your stunts. If you do the same stunt again, it takes more time for that character to perform that same stunt and you would fail. Tip made by Roughdawg4 – Use Marty and do 100CC. (Do the freighter level for the 5 stunt combo). What you need to do is hit square at the end of the ramp to jump to get additional air. After you do this you must alternate between up and down backflips until you get it. After a little trial I noticed up and down is slightly faster than left and right. Make sure you boost to get some additional speed. I did not use any items to get this so you don’t need any. You should get this trophy before completing all championships from 50CC to 200CC. At the end of the race, you’ll earn mangos. The higher the rank in the race, the more mangos you earn. I didn’t get this trophy after completing the championships but that’s okay. If you haven’t too, you DON’T have to play a quick race to get more. If you are following my roadmap, you will get this trophy in no time as you can collect mangos in Time Trial modes, Move It! Move It! modes and Checkpoint races. 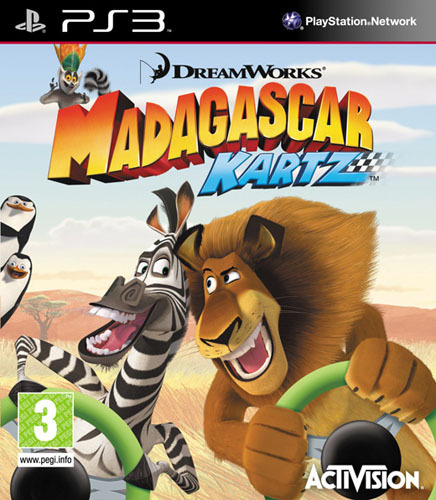 Collect all other Madagascar Kartz Trophies. May I present you, this platinum trophy! Collect all 50 trophies, and this trophy is yours!